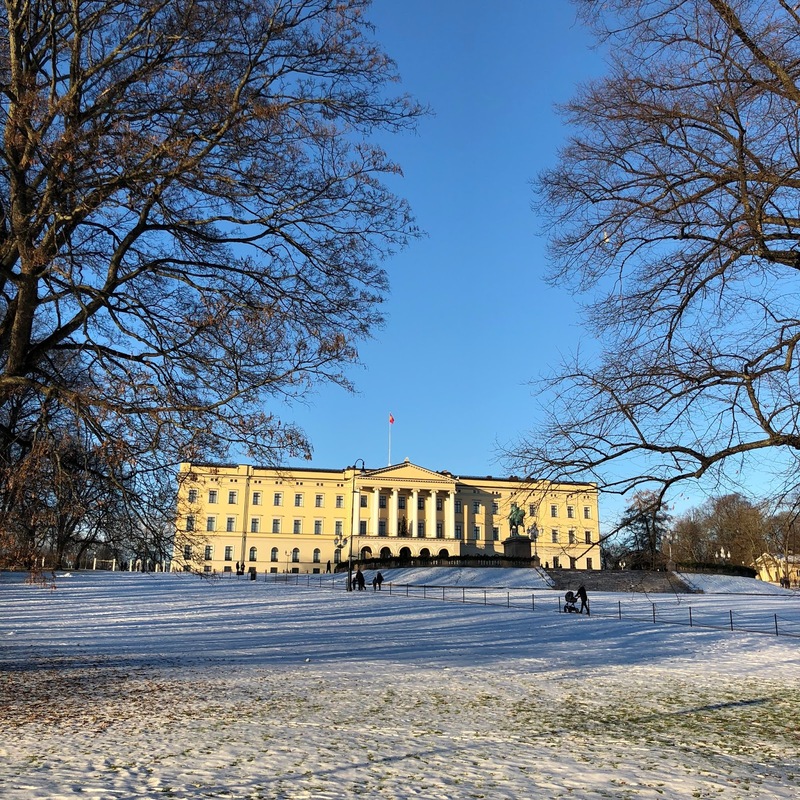 I’d be lying if I said Oslo has ever been on my travel hit list. It has been somewhere I’ve looked at in the past for a potential city break but then after scouring the ‘Things To Do’ section of Trip Advisor it has always left me feeling that there wasn’t enough there to see and do to warrant a visit. 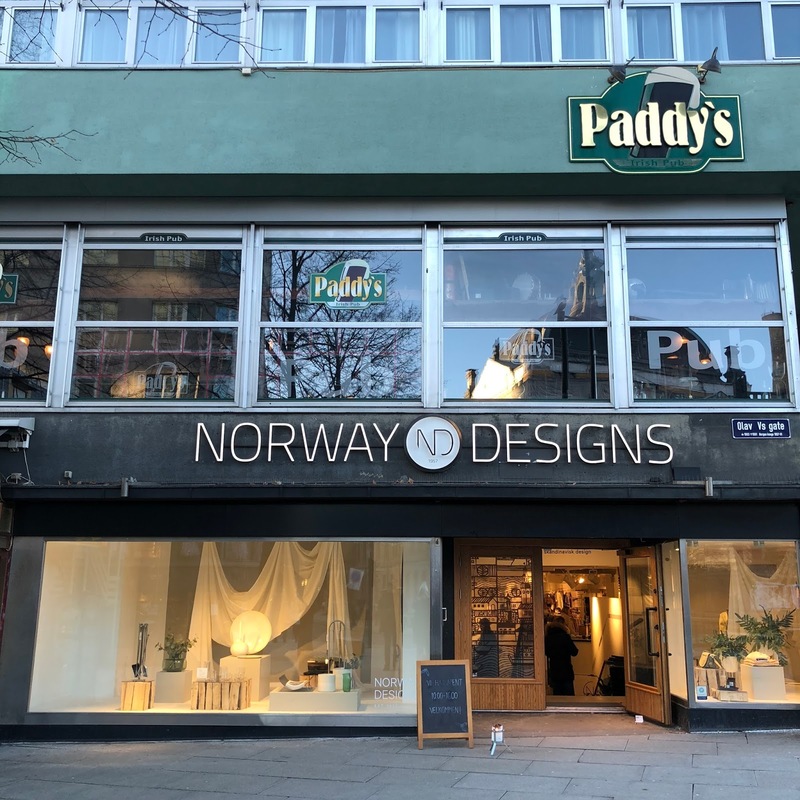 When it came to organising our Winter holiday this year we knew that we wanted to have another go at seeing the Northern Lights and, as someone who likes to visit new places, Norway seemed like a great option. Tromsø in the North or Norway, and into the Arctic, was our chosen destination for the aurora hunting and after looking at the flights it seemed that the easiest option for us was to go via Oslo and get an internal flight North. 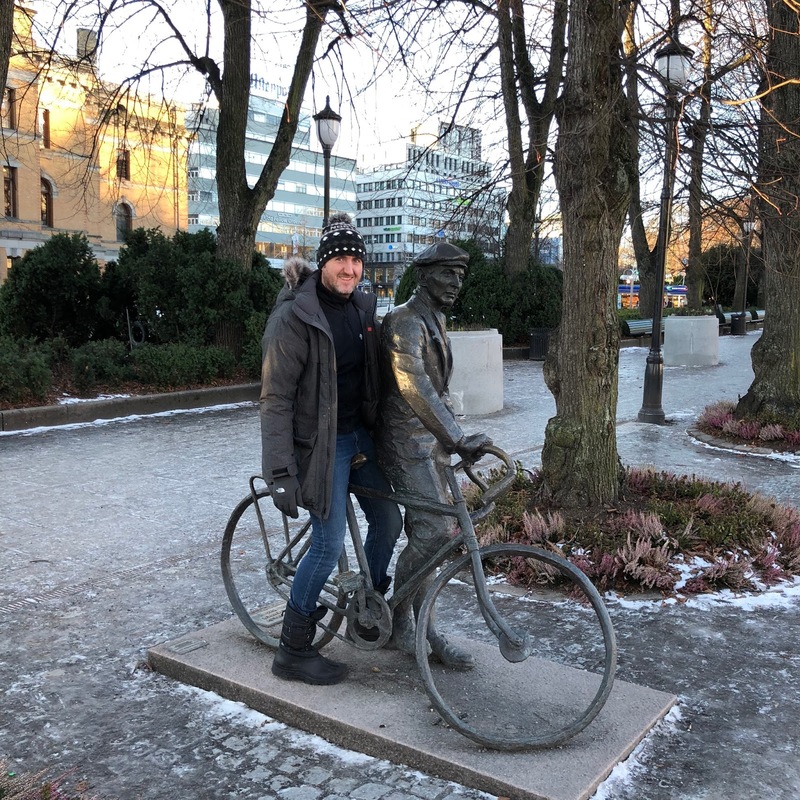 As neither of us had never been to Oslo before we decided that we may as well stop a couple of nights to explore the city rather than just passing through. On arriving in Oslo it was dark and cold and really hard to get a feel for the city on our first day. One thing that really stood out to me was just how quiet it was. Our first evening of exploring was on a Friday night and it was almost like a ghost town! I had also expected the shops to maybe stay open quite late being in the capital city, but all of them seemed to close pretty early which diminished my hopes of an evening wander around interior shops. On our first night we chose to eat at the place which was on the top position of my restaurants list, Nordvegan. Fortunately it was quiet and we had no issue in just walking in and bagging a table. I had heard that this is a buffet restaurant but on arrival I realised it wasn’t a ‘help yourself’ set up and instead more of a point at what you want from the counter deal. 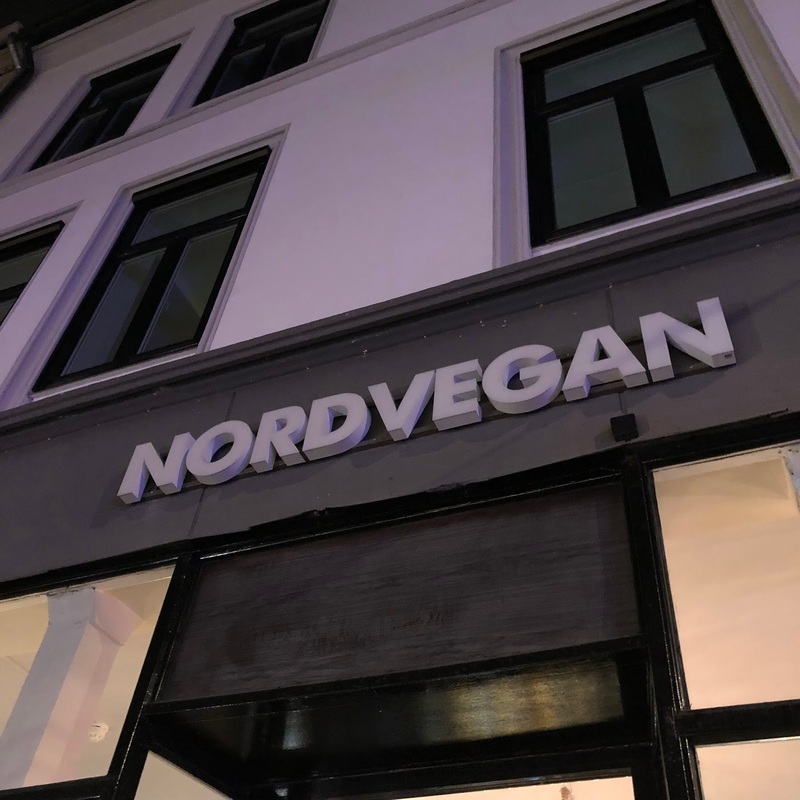 Nordvegan is a fully vegan restaurant and the all of the food looked amazing and just what I needed after a day of travelling. I opted for the lasagne and a side of potato wedges and salad. The food although tasty was pretty cold, particularly the wedges which was disappointing as they looked quite well done. It was a shame as I really wanted something hot inside me but nevertheless it was tasty and it satisfied my hunger. The next day we saw sunshine and blue skies for the first time and I was finally able to see the city in daylight and get a better feel for the place. 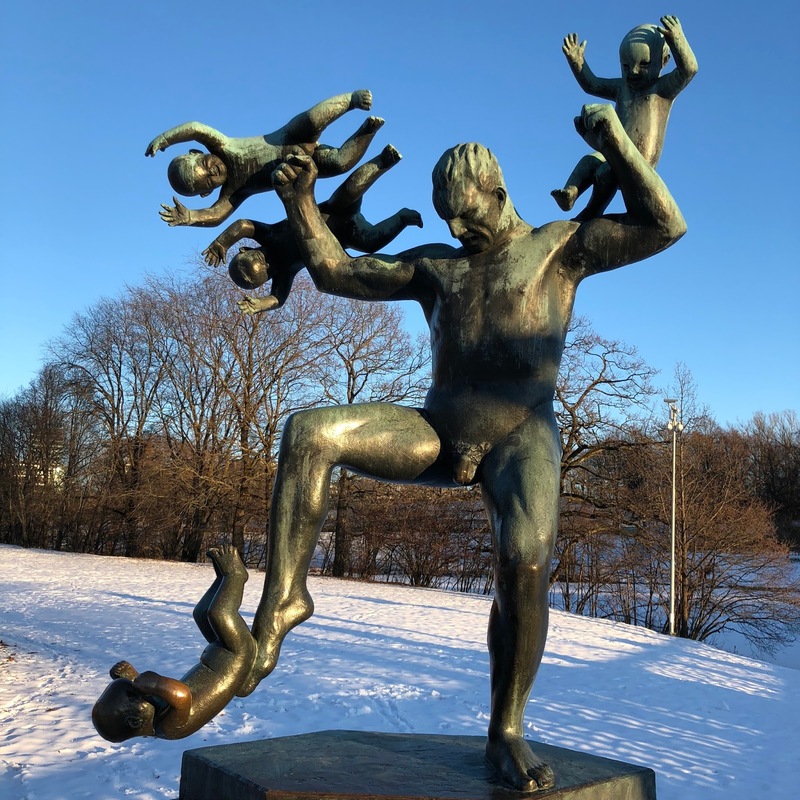 We didn’t have a huge amount on our to do list but one thing I really fancied doing was the hour walk to the sculpture park Vigelandsparken. I’m so glad we did this because the walk enabled us to see quite a lot of the city as it passed by the Royal Palace and through a great shopping road (Valkyriegata). When we arrived at the park it was so beautiful and well worth the walk. There isn’t a huge amount to do at the park other than admire the sculptures, take some photos and do some cute dog spotting. Although quite touristy it also seemed to be popular with the locals and it was lovely to see families having fun sledging and playing together in the snow. I would suggest definitely taking a sledge along with you if you can and if you are visiting in Winter. It looked like so much fun and we were a little let down that we hadn’t followed our urge to buy one earlier. 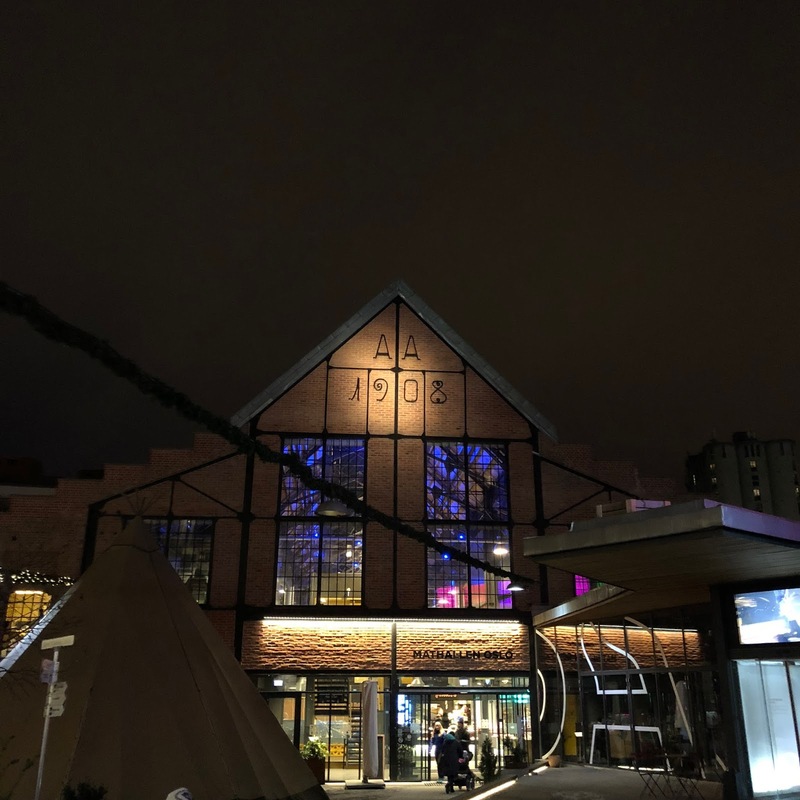 On our second night in Oslo we headed to Funky Fresh Foods for dinner which was a little difficult to find tucked away inside and upstairs in some kind of design and architecture hub. Once inside it was clear to see why this place is popular with the veggies and vegans as it’s so cosy with some lovely views over the river. I have to say that this meal was way more enjoyable for me than the previous night, mainly because the food was hot! We both went in for the vegan burger with cheese which was delicious and came with a mix of regular and sweet potato wedges. The burger itself was made from black beans and included a few different toppings inside the bun including pesto. After a long day of walking this was exactly what we needed! The next day in Oslo was a Sunday and after a little search online I soon found out that most places completely close up on Sundays, all bar some museums and restaurants. This seemed so alien to me that a city would close on a weekend day but it reminded me of what London was like as a child growing up. Everything would close on a Sunday and the emphasis was on it being a day of rest. Despite initially feeling a little put out it later on made me wish things were more like this at home. There isn’t really a need for shops to be open 24/7 and 7 days a week and I think most of us could actually benefit from being forced to slow down! It’s also much fairer on retail staff too. So, as shopping was out of the question we decided to take a short stroll over to see the opera house which is quite famous for its standout architectural design. This was like an ice rink on the day we visited so we had to take things pretty slowly but it was fun to walk up the slopes and see another view of the city. After this we hopped onto a train and headed slightly out of town to Holmenkollen where the famous ski jump and museum was thankfully open for a visit. Whilst on the train I was really taken back by just how many people there were with ski’s all headed out of the city. 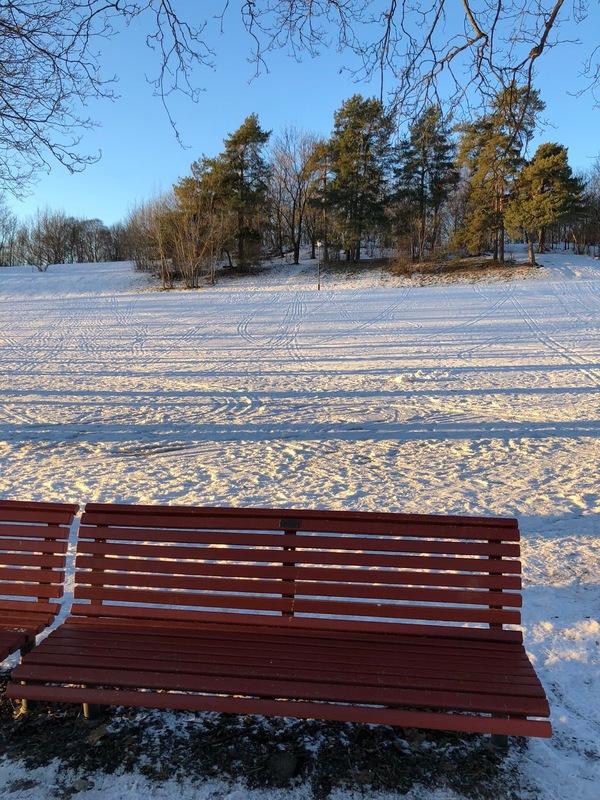 Obviously the done thing to do on a Sunday in Oslo is to get out of town and enjoy the snow! I can’t say I’m hugely interested in skiing, especially after my ski lift accident in Lapland last year! 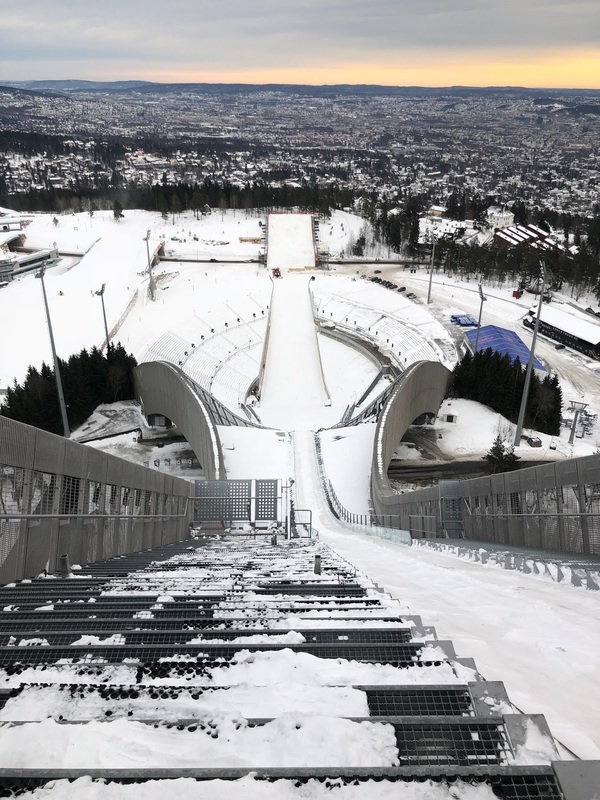 But the museum offered us something to do and I’d heard that the views from the top of the ski jump were pretty impressive. After some photo taking and a mooch of the gift shop it was back on the train back to Oslo. It was actually really nice sitting on the train and taking in some amazing views along the way. It was a chance to see some of the suburbs and the beautiful cabin homes that sit in these areas. 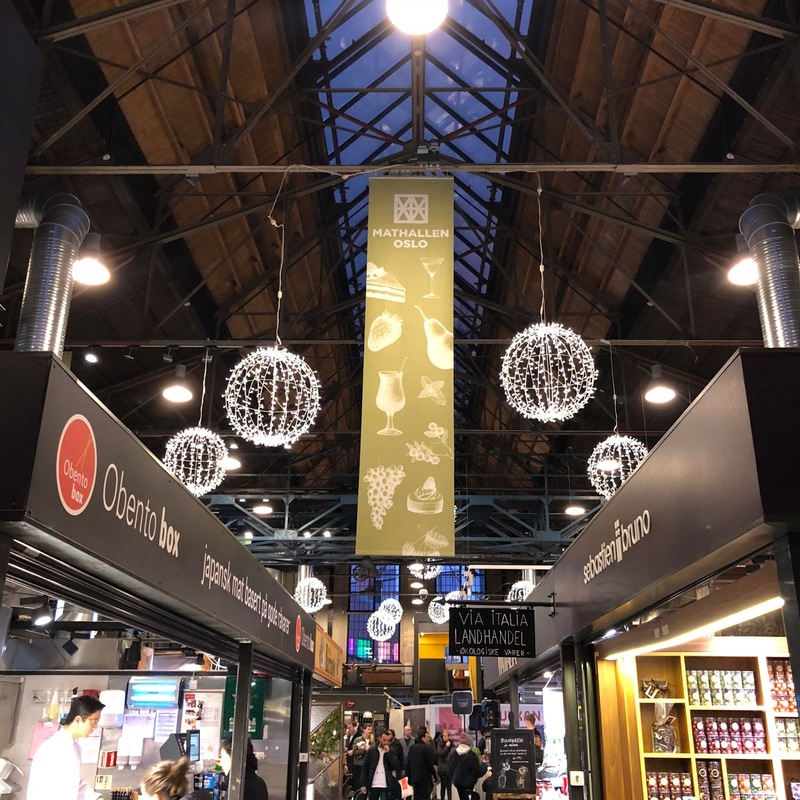 On our third and final night of our city break we decided to head to the food hall Mathallen for dinner. 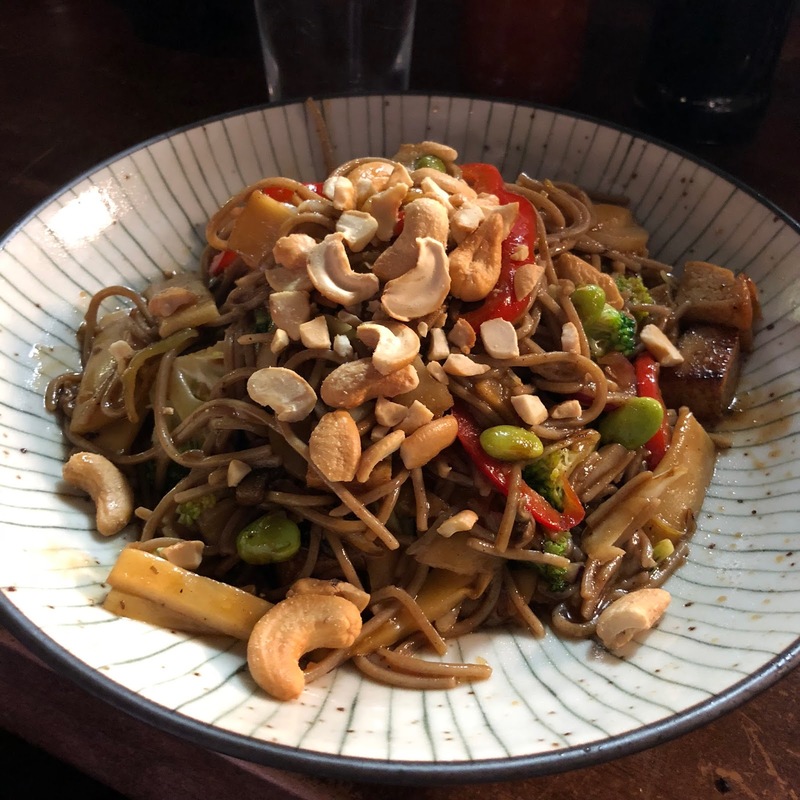 Although not known for its vegan options it seemed like a more authentic place to visit on our trip than any of the other restaurants I had pencilled down and the reviews were also pretty good. 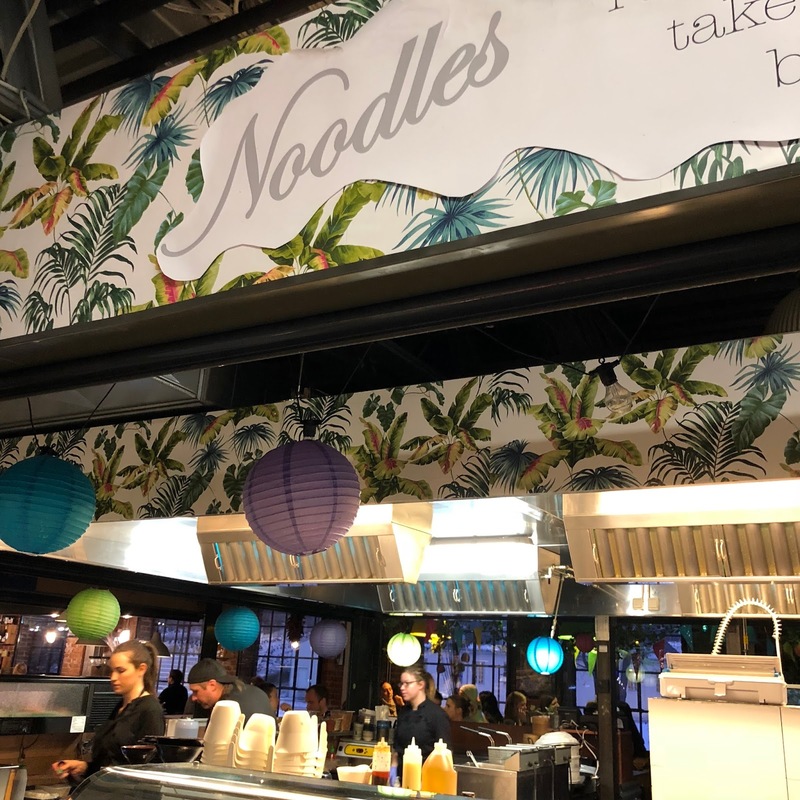 As expected there wasn’t a huge amount for vegans at the food hall and there was a lot of meat, fish and cheese but we did find the Noodles bar which catered really well for us. I enjoyed a really tasty and big bowl of wok fried noodles with an abundance of vegetables and tofu. It was so good! 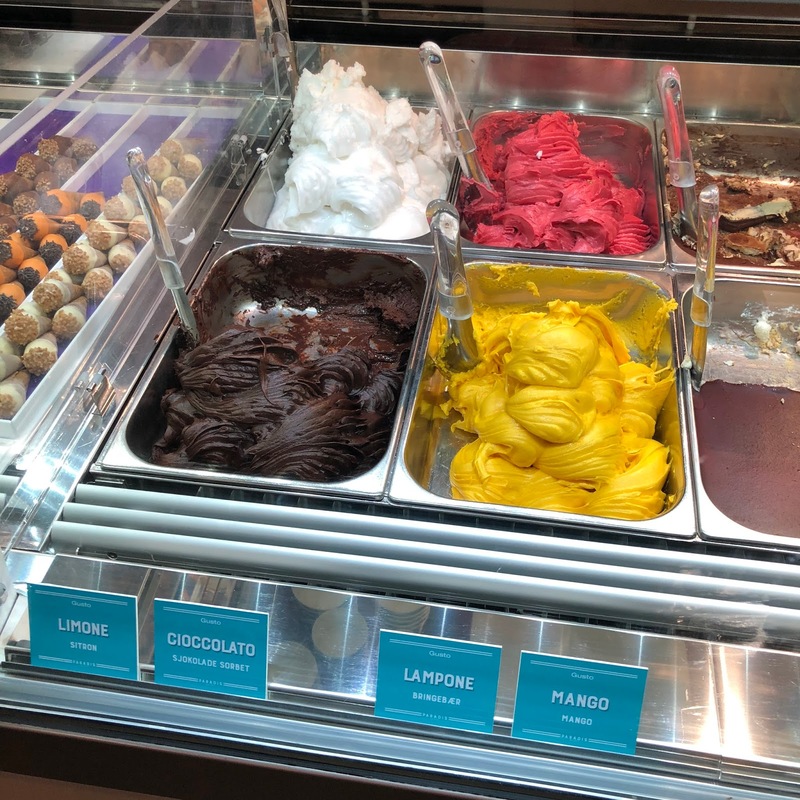 Afterwards we headed next door to the Paradis ice cream stand and I found some dairy free chocolate ice cream which ended the meal out perfectly! One thing I haven’t mentioned yet is just how expensive Oslo is. I had heard that it’s an expensive city but at times I couldn’t quite believe my eyes when looking at price tags. Our simple noodle dinner with a couple of non alcoholic drinks and a starter came to an eye watering £70. And it wasn’t a fancy restaurant, just a food hall vendor! 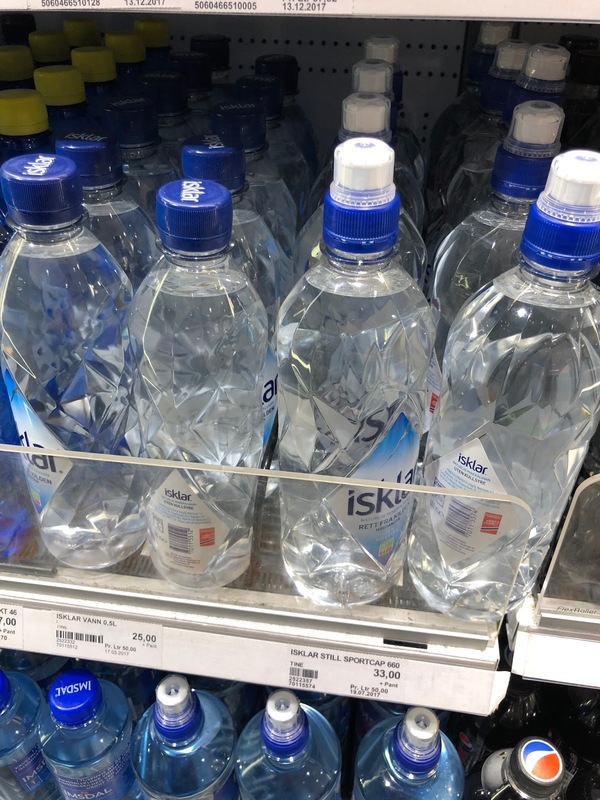 A regular sized bottle of water from the newsagents was £3.30. My husband picked up a fairly standard beanie hat which was £35. On more than one occasion I was drawn in by some fabulous Nordic jumpers until I saw the price tags of £200+. I mean it’s just next level! 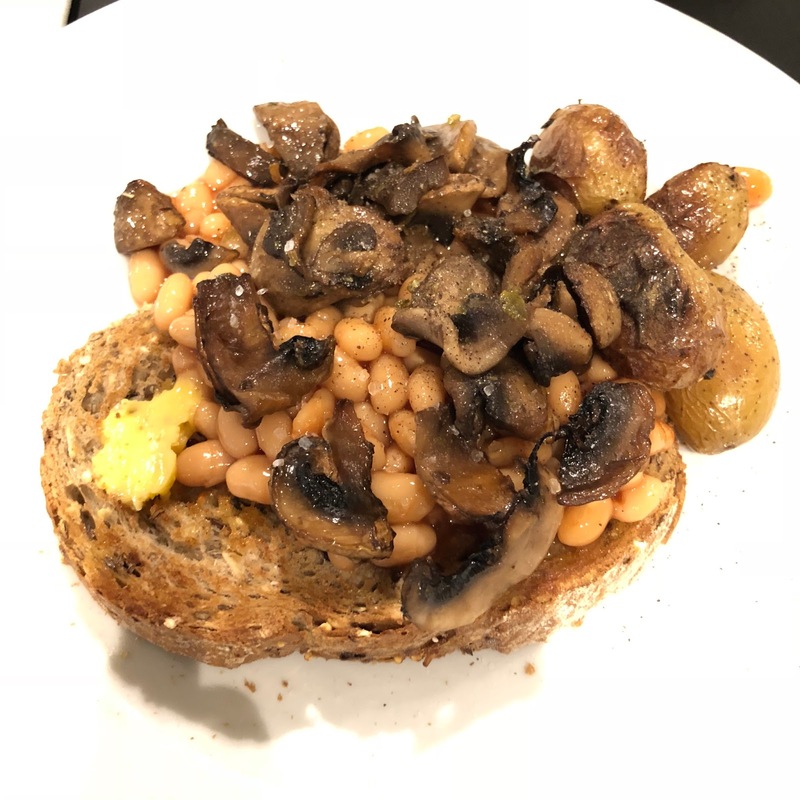 If you’re not too fussed about eating out, and you’re not a food blogger, our hotel (Thon Hotel Terminus) was actually really great value considering we got breakfast and an evening meal included in the price of our stay (approx £100 a night). The breakfast catered for vegans pretty well with toast, beans, mushrooms and potatoes plus a great fruit selection and smoothies. This kept us full until dinner time too. We didn’t partake in the evening meal but on looking at it there didn’t seem to be as much choice, mainly a meat based dish with a potato side and a small salad bar. But this is well worth considering if you’re looking to save some money and stay in the centre of town. 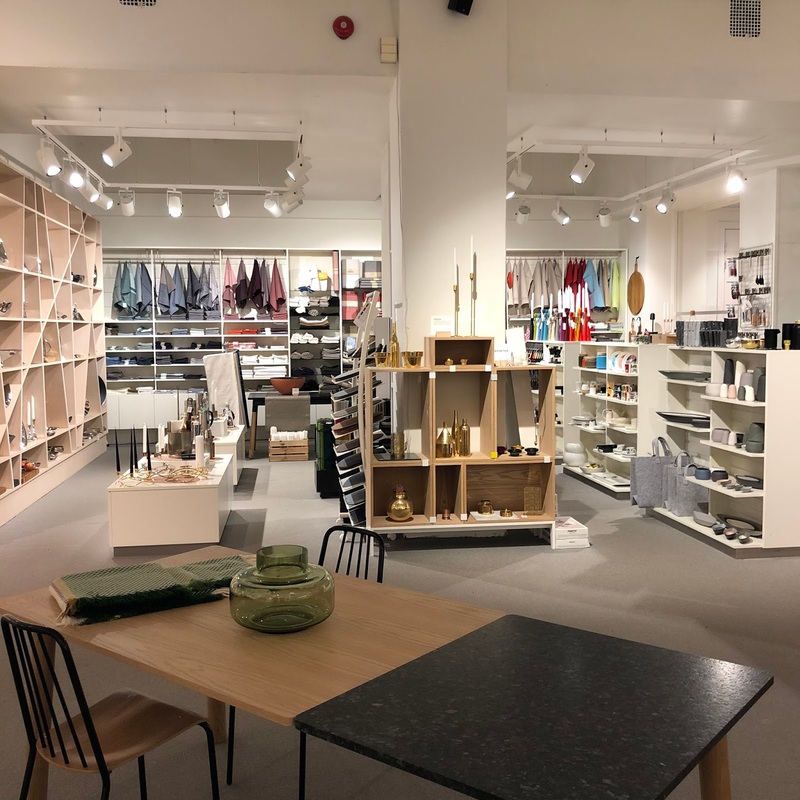 A couple of great shops I discovered in Oslo was firstly the Norway Designs store which is spread across three levels and sells a whole host of Scandinavian design homeware and gifts. It even had a small stationery shop inside which got me very excited! 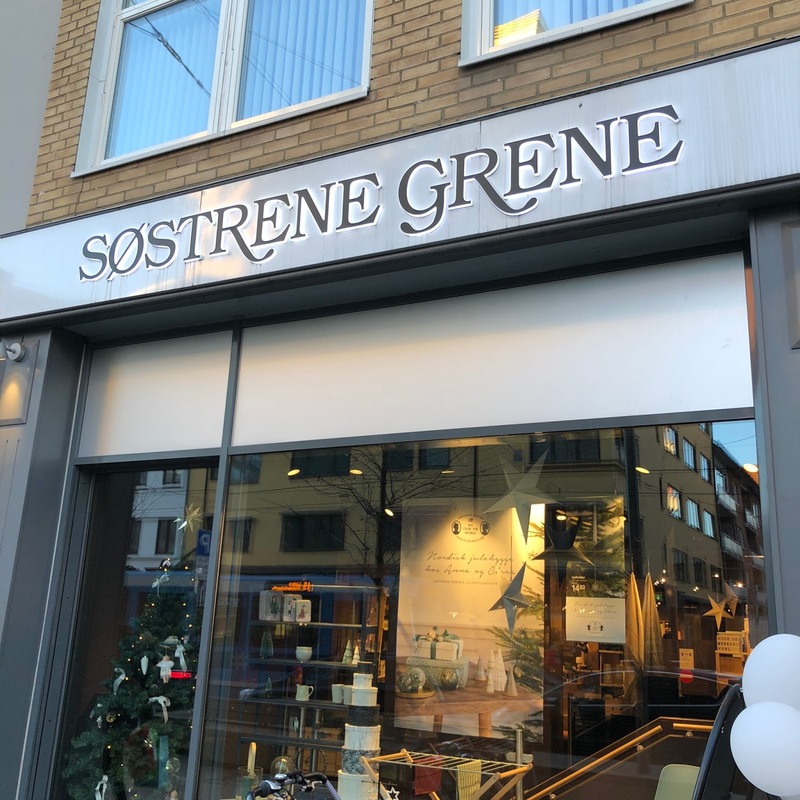 Another great shop I randomly came across whilst walking was Søstrene Grene which was like a cross between Flying Tiger and Ikea and consequently amazing. I actually found it difficult to leave this shop as there was just so much to look at! 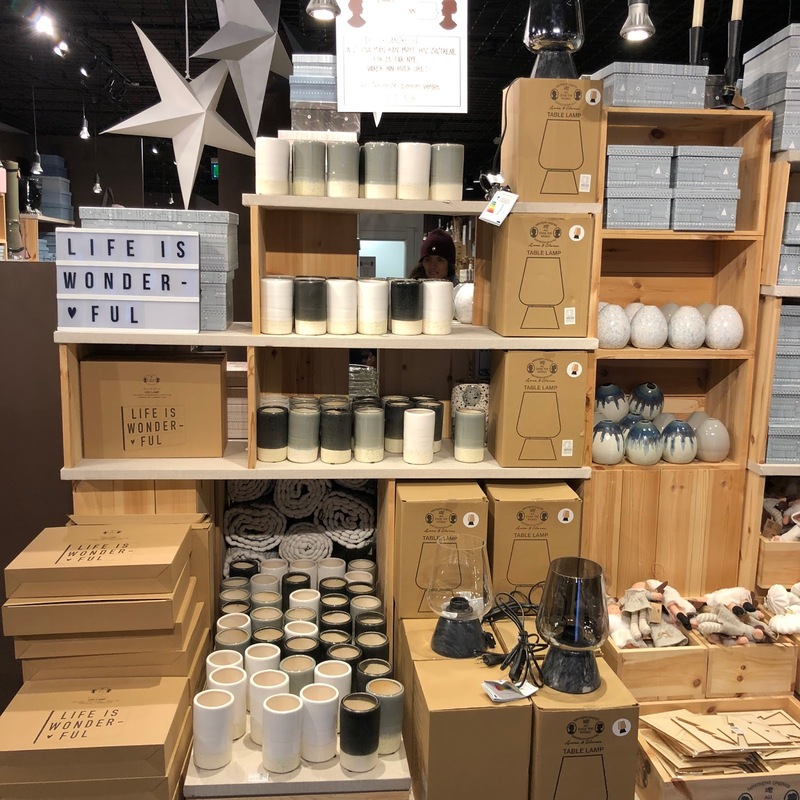 Again, it's mainly along the homeware, accessories and gifts category with a real Scandi influence. I was basically in heaven! Overall we had a really nice couple of days in Oslo and we enjoyed exploring what the city had to offer. If I'm being honest I probably wouldn’t put it up there as a must see city as there just wasn’t really enough to do there for me to feel really excited about it. 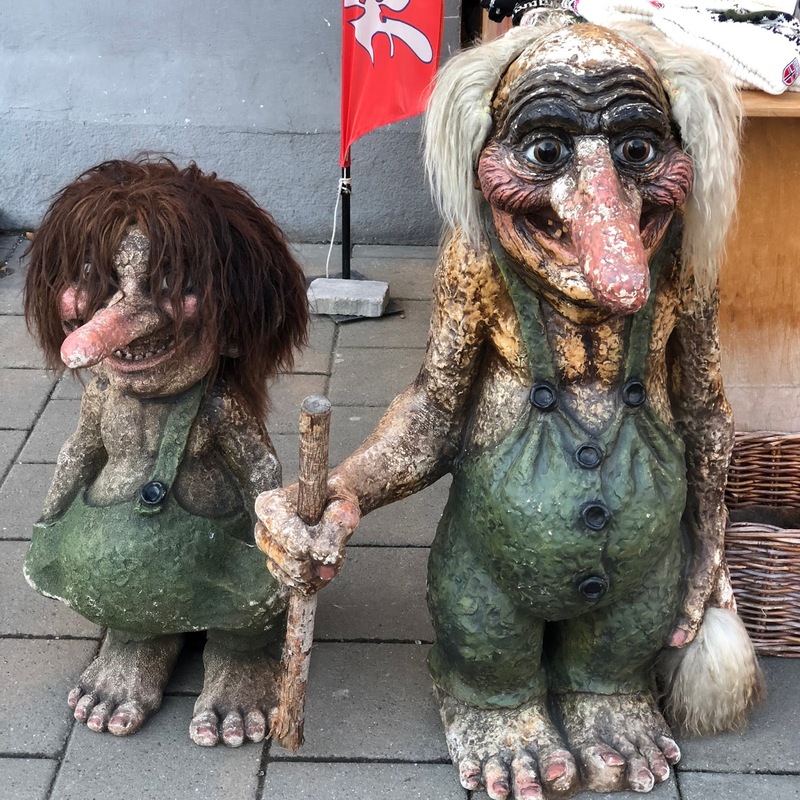 But it’s definitely worth a stop over if you’re headed to Norway and, if like us, you’ve never been before. But for me personally I think the real beauty and excitement of Norway lies in the scenery outside of the city. Keep an eye out for my Tromsø blog post coming after this one as I’ll be reporting back on our Northern Lights adventure soon. And you can catch the Norway vlog here! Plus you can watch some snippets of our trip over on my Instagram Stories highlights. 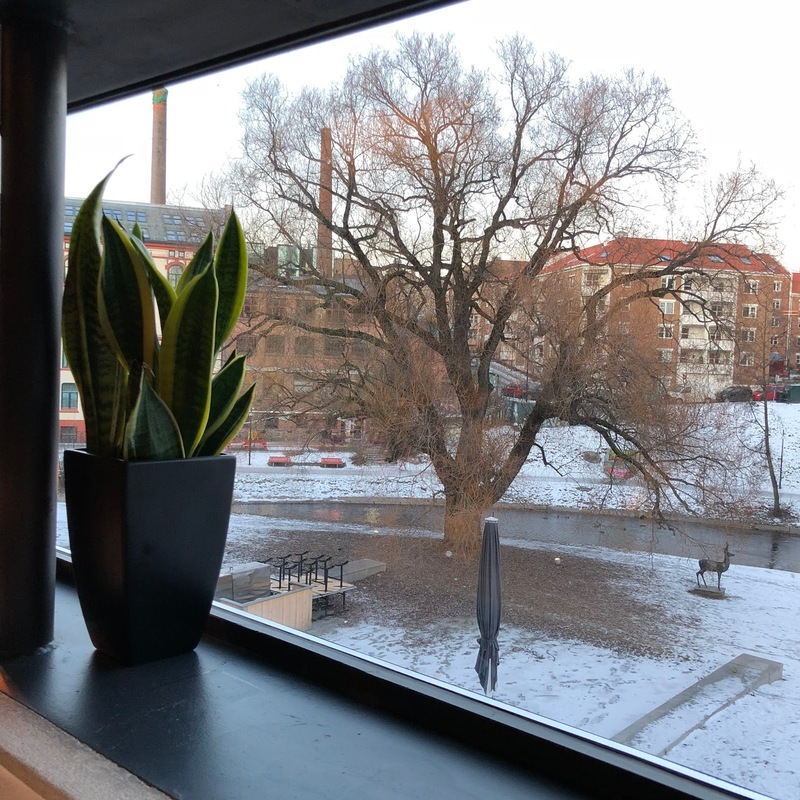 If you have any other advice or recommendations for Oslo then please do comment below and let us all know. It'd be great to hear about some of your own experiences in this city! Thanks for sharing - it looks like you had a great time despite there not being much to see. I am shocked at how expensive the food is though! Extortionate! This post will hopefully warn others. The vegan food you did find looked delicious however! I look forward to your Northern Lights post! I'm planning a trip to either Oslo or Bergen this summer, so fun to check out the places you visited!